St. Petersburg, June 2 (IANS) American journalist Megyn Kelly has come under widespread online criticism for asking Prime Minister Narendra Modi — the second-most followed politician on Twitter with over 30 million followers — if he was on the micro-blogging site. 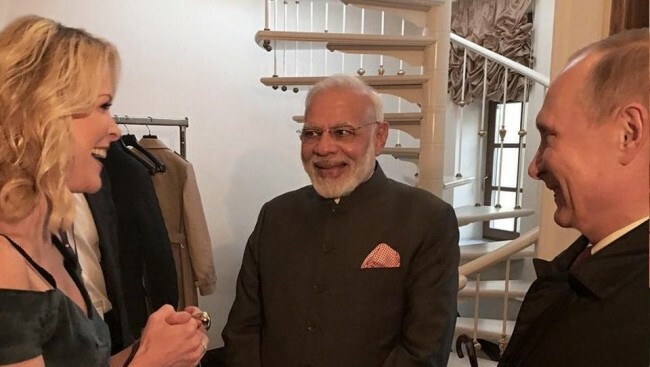 Kelly, 46, met Modi when she had to interview Russian President Vladimir Putin in this Russian city for her new NBC show. The channel aired a teaser video on Friday morning of the show where Kelly greets Putin and Modi at state party dinner at the Konstantin Palace in St. Petersburg. Modi tells the American journalist that he had seen a picture of her with an umbrella in St. Petersburg she had posted on Twitter. The picture Modi referred to had a caption: “Things are looking up in St. Petersburg – the rain stopped…& I will interview President Putin on Friday”. “Ohh really! Did you? Are you on Twitter?” Kelly replied with a broad smile. Apparently taken aback, Modi nodded saying ‘yes’. Her poser invited an online backlash. The journalist was accused of not doing her homework. “Sheesh. @megynkelly asks @narendramodi who has 30 million followers if he’s on Twitter. What does it take to get India on the radar screen,” tweeted Alyssa Ayres, a senior fellow for India, Pakistan and South Asia at the Washington-based Council on Foreign Relations. Modi has 30.3 million followers on Twitter making him the second most followed politician in the world after US President Donald Trump with 31.2 million followers. Overall Modi is ranked at the 35th spot in the list of most followers on Twitter. American singer and songwriter Katy Perry holds the No.1 spot with over 99 million followers.